In the opener to this four-part series, we discussed the connection between your oral care and overall health, which is called oral systematic connection. As we move forward, we now look at one of the problems that can arise from poor oral hygiene and gum disease (periodontitis) – the development of Alzheimer’s disease. As you read on, you’ll learn what this disease is and how your oral health can contribute to it. Alzheimer’s disease is a neural-degenerative condition that mainly attacks the limbic system – the part of the brain that regulates the storage of long-term memories. The disease basically eats away at the tissue in and around that part of the brain, dissolving the patient’s ability to remember and reason appropriately. The connection between Alzheimer’s and gum disease was discovered through monitoring the susceptibility of older patients with a history of periodontitis. 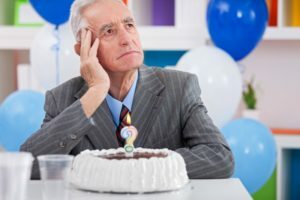 Researchers found that when comparing the cognitive function at ages 50 and 70, gum disease at the age of 70 was strongly associated with low scores on cognitive function tests. How Do Oral Bacteria Contribute to Alzheimer’s Disease? Unchecked oral bacteria that develop into periodontitis start as simple cavities that are overlooked as they continue to burrow deeper into the tooth. Eventually, they work their way beneath the gum line and infect the tissue. The infection then causes inflammation, which is one of the body’s natural defense mechanisms to an attack. Furthermore, a byproduct of inflammation in the blood is the influx of stress hormones like cortisol, adrenaline and others that eventually become toxic from remaining in the bloodstream too long. When this blood travels to the brain, it morphs into problems that are specific to the area, such as Alzheimer’s disease. Practicing Excellent Oral Hygiene – The simple disciplines of brushing and flossing your teeth at least two times a day helps majorly in ridding your mouth, teeth and gums of harmful bacteria that can contribute to such problems as gum disease and Alzheimer’s. Visiting Your Dentist – Along with caring for your oral cavity properly, be sure to visit your dentist semi-annually for cleanings and checkups. These appointments prevent minor problems from having the time to develop into major overall health issues. By taking a proactive approach to your dental health, you will also be positively impacting your overall wellness. To learn more or to schedule a preventive care visit, reach out to your Frisco dentist today! A graduate of Baylor University, Dr. Jill Wade has been a leading figure in the dentistry world for two decades. She is a founding member of the American Academy of Oral Systematic Health and serves on the board of the Institute of Arteriology. Still, Dr. Wade manages to provide exemplary care for her patients at Stonebriar Smile Design. She can be reached for more information through her website.